The MFG is more a magazine, also with other comics. See below for some pictures how it looks. 40 pages in two sections. B&W newspaper format magazine, but on better paper than newsprint. Opens out into tabloid sized pages, 11 ½ X 16 ½ inches. 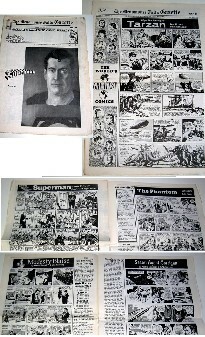 Reprints current and historic US, UK and one Australian newspaper comic strips. (One week of dailies or a Sunday page, or both.) Value around 10 USD. Under the label "Street Comics" the MFG did print Valiant in a special magazine: issue nr 1, from 1-12-1973. The volume is called "Strip comics from the 30's".Value is around 15 USD.